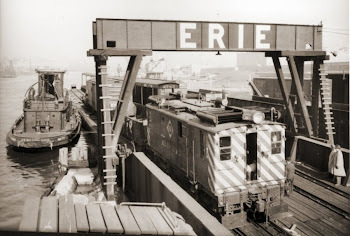 Erie Harlem Station: Kit Manufacturers Comparison or Where's The Fun? 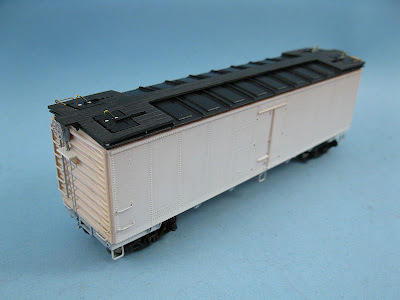 Over the last few weeks, I’ve been working on several freight car kits to build up Harlem Station roster. I had to deal with kits from various manufacturers and thought it would be neat to share my impressions of each ones. It must be noted I’ve built models from these manufacturers for a long time. However, it was the first time I built some much detailed cars in such a short amount of time and with a focus on small details (brake gear, grabirons, roofwalk, etc.). Life-Like: not a contest winner, but definitely an enjoyable process. My endeavour started with a pair of Life-Like/Varney refrigerator cars. While absolutely crude, the sturdy and thick plastic used back then proved to be a blessing during the process. It is a sound and solid foundation upon which to one can add details to its heart content. Once again, Tichy details proved to be great to work with while Intermountain brittle plastic was less fun. Accurail AB brake assemblies saved also a lot of time and money. They can be modified too, though I’m not a fan of delrin plastic since I had to use epoxy glue to keep them permanently attached to the car. As much as possible, I prefer to use plastic that can be cemented with solvent. I also used Accurail Bettendorf trucks which are finely casted and affordable. The fine lettering moulded on is a plus to me. I certainly wish Accurail made more trucks. Finally, Kadee brake wheel were a bliss to install. Probably among the best on the market and ones must admit they are incredibly sturdy while having the finest cross section you can expect in HO scale. Overall, kitbashing Life-Like and Varney old train set took a lot of time, but it was a fun process and never tiresome or frustrating. You could almost consider it scratchbuilding since only the basic shell was kept and could have been easily built from scratch with less effort. The next model I worked on were four Life-Like Proto 2000 Greenville Mill Gondolas. The last time I built this specific car, I was in high school back in 1999 and used a dull X-acto blade and CA glue. I recall the process to have been tedious. This time, sharp blades, solvent cement and tweezers made it much easier. However, the notoriously flimsy stirrups and annoying brake gear are certainly irritating aspects of P2K cars. I decided to order photo etched replacements from Pierre Oliver. However, I must admit the P2K cars are great to build and prototypical to booth. When you know their weaknesses, you can work things around so they are sturdier. 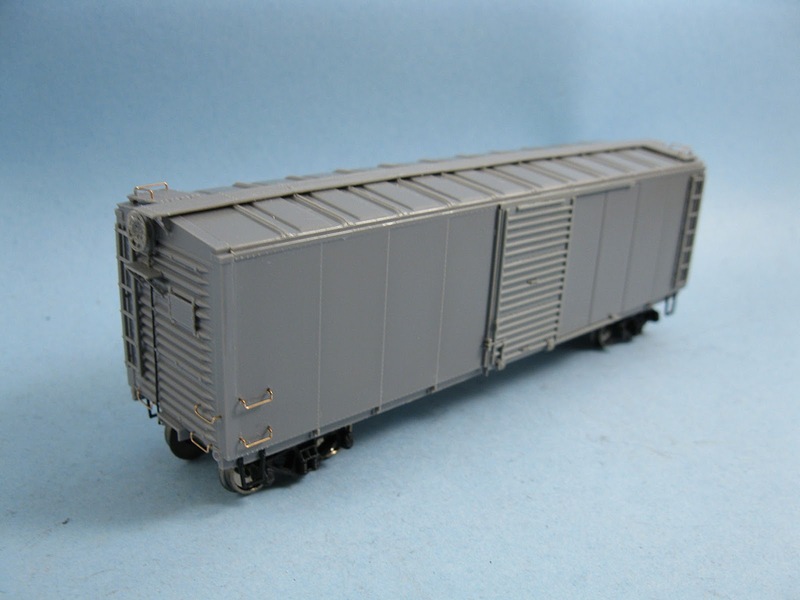 Then, I decided to tackle a pair of C&BT Santa Fe ice steel reefer. Tony Thompson and Andy Sperandeo once wrote about these cars back in the early 1990s. I thought Thompson was quite harsh when he concluded on his blog they weren’t worth the trouble. But after having spent hours on them, I must admit he was right. The plastic C&BT used is annoying at best. It is brittle and for this reason, many parts had to be oversized. This limitation also made many parts to look coarse approximation of the real thing, even from Average Joe’s standards. I ended up partially trashing the B-end details, the brake gear, ladders, stirrups, hinges, etc… I think you understand the pattern, only the shell was salvageable. But even then, dimensional errors plague the model. The roof doesn’t sit at the proper height and has oversized overhangs. The roofwalk is a joke, many platform brackets not molded. I also had to alter the roof platform so they be prototypically correct (SFRD platform had long slots so the hatch latches could be dropped into it and not be a hazard for workers). At the end of the day, you end up with a model you need to extensively rebuild, alter and modify. It seems C&BT worked with flawed and insufficient data which made the model an approximation of the car. I can understand the limitation of the early 1990s, but it is quite frustrating to trash almost every details and waste time rectifying another’s mistakes only to get a passable result. When I buy a kit, I generally understand I can build it straightforwardly without having to extensively rebuild it (except if it is the stated goal from the start). I certainly don’t recommend this car, particularly when a vastly superior model is now available from Intermountain. 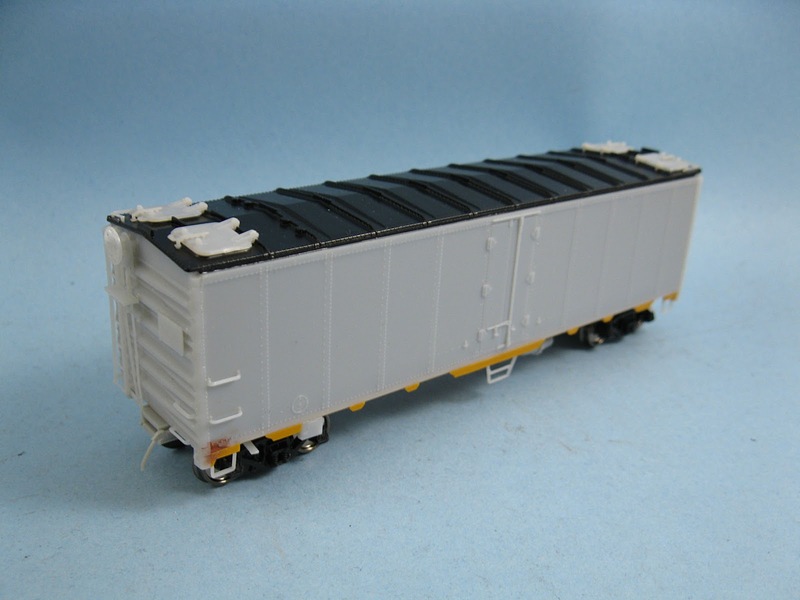 I then built two Intermountain PFE R-40-23 reefers. They did a great job capturing the prototype and the building process is quite straigtforward. However, I’m not a fan of the plastic type favoured by Intermountain. It is quite flimsy for small parts and can easily break during handling. They plastic stirrups are a lost cause. They broke the moment I installed them and I can assure you I used paranoiac care to make sure they would survive. Thus, I ordered photo-etched replacement parts from Pierre Oliver too! But that said, Intermountain cars are generally well-designed and easy to assemble. The instructions are easy to follow too, which is a necessity when dealing with hundreds of parts. The Intermountain models then prompted me to update four Athearn 40ft ice steel reefer. 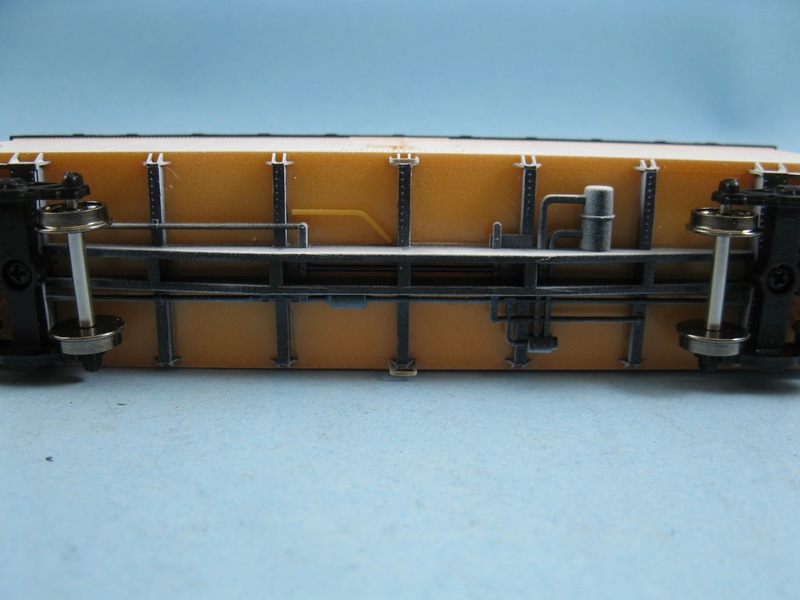 Knowing the car was based on the PFE R-40-23 design, I ordered several Intermountain detail parts. I also extensively kitbashed the roof and hatches so they would be closer to the prototype. Using the Intermountain cars as a reference made it quite easier to do. While it required a lot of work, it was a great and rewarding challenge. I don’t regret any minute working on these cars and think they will be a great addition to my layout when completed. 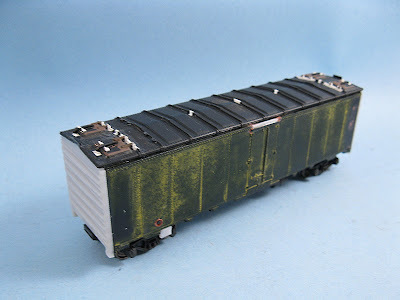 Finally, I continued my endeavour by tackling a bunch of Tichy USRA boxcars (single sheathed and rebuilt). 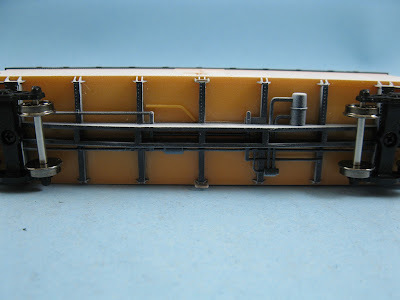 Must I say Tichy product have the detail quality of resin kits and the ease of assembly of styrene kits for a fraction of the cost (even competing with Accurail). It is the best of both worlds. The level of detail is incredible and parts are generally free of flashes. Assembly is straight forward, instructions are generally well written and they use a sturdy type of plastic that is both durable and easy to work with. That wraps up my impression with working with various types of kits available on the market. Meanwhile, I’ll soon have to work with Rapido kits (which are devoid of any instruction), Westerfield and Funaro & Carmerlengo resin kits. While I’m not new to resin kits – having built my share of Japanese garage kit and a Sylvan CN caboose back in my college days – I’m curious to see how I’ll find the experience. Nice! I love finished models without paint.